In a number of cases, roofing on properties had been partially lifted off the structures by strong winds. Johannesburg Mayor Herman Mashaba on Friday declared a local state of disaster in the City as a result of last week’s violent storm and heavy rains. Hundreds of households were left destitute after a heavy storm battered down some parts of south and west Johannesburg on Saturday afternoon, blowing off roofs, uprooting trees and damaging vehicles, particularly in Protea Glen in Soweto. Two people were killed in Lenasia, south of the city centre, after a tree fell on top of the car they were travelling in, and part of the roof of Trade Route Mall in the same area collapsed from flooding. Areas such as Lenasia, Tshepisong, Thembelihle, Alexandra, Maria Lewis, Protea Glen Extensions, Westbusy, Rooderpoort, Kagiso and Braamfishcerville were severely impacted by leaving a trail of property destruction in its trail. “Given the damage to the City, the provisions of the Disaster Management Act, and extensive stakeholder consultations, including the Gauteng Provincial Disaster Management Centre, I have taken the decision that the City must declare a local state of disaster,” Mashaba said in a statement. Mashaba held a meeting on Friday with officials from the City’s entities such as the City’s Disaster Management Centre, Environmental Health, Citizen Relationship and Urban Management, Social Development and Group Risk and Advisory Services departments, City entities, NGOs and officials from the Gauteng Provincial government. He said that in the main, the damages included failing roofs, boundary walls and collapsing household extensions. The affected structures are said to be between one to 20 years old. 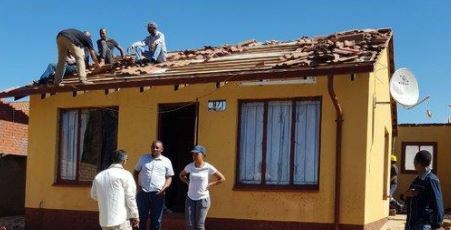 In a number of cases, roofing on properties had been partially lifted off the structures by strong winds. Mashaba also said that the City’s main priority was to ensure that affected residents receive the necessary disaster relief materials promptly, and that the recent resistance from a few community members was unacceptable.